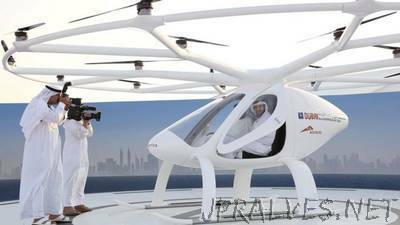 “Dubai has conducted its first test of a drone taxi service that it hopes will become a viable transportation system in the city. The two-seater, 18-rotor unmanned vehicle took off for a five-minute flight above a strip of sand on the Gulf coast. The flight was watched by Crown Prince Sheikh Hamdan bin Mohammed. Dubai has big ambitions for becoming a smart city, with drones and robots central to its plans. The drone was designed by German firm Volocopter and the firm said it hopes to have the taxis up and running within five years. “Implementation would see you using your smartphone, having an app, and ordering a Volocopter to the next Voloport near you,” said chief executive Florian Reuter. The drone had previously been tested in Germany in April. Rival Chinese firm eHang was supposed to be the first to launch a fleet of flying taxis in the city but its plans appear to have been delayed. Dubai has positioned itself to become the smartest city in the world with ambitions to have self-driving vehicles account for a quarter of journeys made by 2030. Noel Sharkey, a computer scientist and robotics expert at Sheffield University, said of the drone plans: “The big challenge will be dynamic obstacle avoidance of other taxis, buildings, birds and delivery drones.